Switch’s interactive learning lab makes its debut at 8th Annual ArtPrize in Grand Rapids, Michigan. An interactive, new ArtPrize Eight attraction aimed at helping kids start thinking about their future careers opens Saturday. Many people have heard of STEM education which focuses on science, technology, engineering, and mathematics (STEM). But, ArtPrize Eight officials are supporting the efforts of a number of schools nationwide to promote STEAM education, which adds in the arts. ArtPrize teamed up with SWITCH to open the new STEAM Village Learning Lab, located at the ArtPrize HUB on 41 Sheldon Boulevard in Grand Rapids. It consists of five stations that kids of all ages can enjoy. Becca Guyette, the ArtPrize education manager, said that kids are having fun while also seeing how the fields included in STEAM education all work cohesively. She used station four, a video game called “Planet 3” that will also soon debut in some 7th grade science classes, as a good example of STEAM at work. From creative problem-solving to virtual reality, the stations are very hands-on. 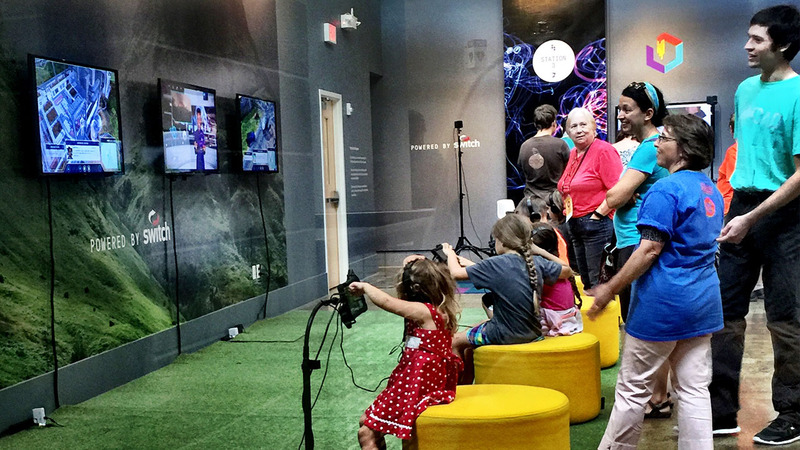 The virtual reality station paints a clear picture of immersive education. With the technological job market surging, another station breaks down coding for even the youngest crowds. It uses Code.org technology, and each challenge gets more difficult. There are a few other stations, including a stop where people can view last year’s winners. Guyette said that the whole lab is meant to get people thinking about how arts really do work hand-in-hand with other areas. About 19,000 students are expected to visit ArtPrize Eight, many of whom will visit the lab with school groups. The STEAM Village Learning Lab will be open daily from 11 a.m. to 6 p.m. starting Saturday. ArtPrize Eight returns to downtown Grand Rapids Sept. 21 through Oct. 9. NOTE: This is a republished version of an original article written by Marvis Herring, for WOOD TV. His featured story appeared on WOOD TV’s website on September 16, 2016.